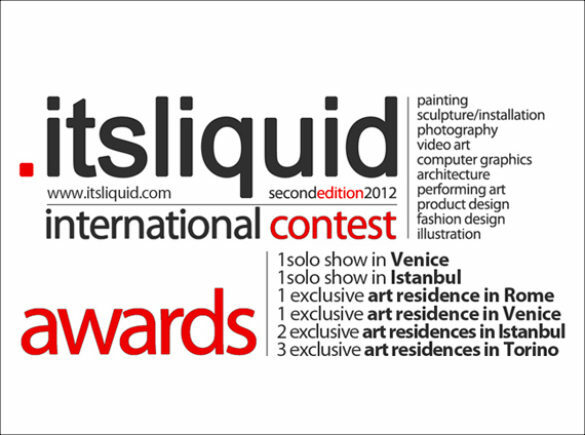 Since 2012, ITSLIQUID GROUP organized several International Contests with the main goal of promoting contemporary art, architecture, design and fashion through all the divulging tools that the communication platform ITSLIQUID has used from its foundation: press release, mailing list with more than 200.000 subscribers, international contemporary art and design events realization. The organization of the International Contests is developed in partnership with an international professional jury, composed by renowned curators, gallerists, architects, artists and fashion designers, high level experts and professionals in many different Art sectors. The contests give the possibility to artists, architects, designers from all over the world to be exhibited in the most prestigious Art Cities in the world, to be featured on important Art magazines and platforms and become part of the International Art World. 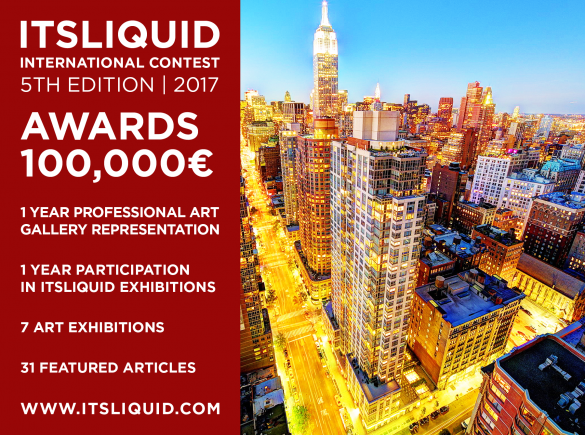 ITSLIQUID GROUP is proud to announce ITSLIQUID International Contest – 5th Edition 2017, a free theme international contest open to artists, architects, designers and fashion designers from all over the world, divided into ten categories: painting, installation/sculpture, photography, video art, computer graphics, architecture, performing art, product design, fashion design and illustration/drawing. The contest is born aiming at promoting contemporary art, architecture, design and fashion through all the divulging tools that the communication platform ITSLIQUID GROUP has used for years (press release, mailing list with more than 200,000 subscribers, international contemporary art, architecture, design and fashion events realization). ITSLIQUID GROUP is proud to announce ITSLIQUID International Contest – 4th Edition 2017, a free theme international contest open to artists, architects, designers and fashion designers from all over the world, divided into ten categories: painting, installation/sculpture, photography, video art, computer graphics, architecture, performing art, product design, fashion design and illustration/drawing. The contest had ten main categories: painting, sculpture and installation, photography, video-art, computer graphics, architecture, performing art, product design, fashion design, illustration. 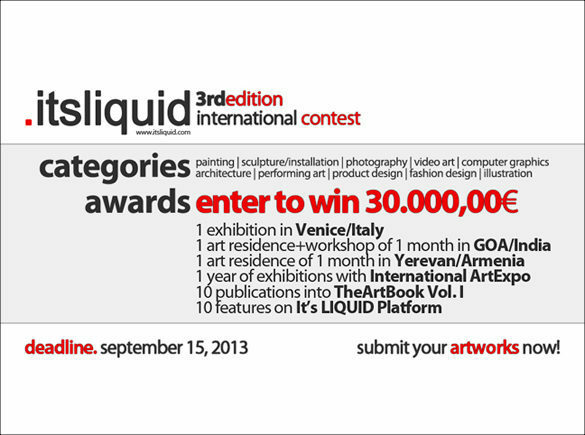 The third edition of ITSLIQUID International Contest 2013 received more than 2,000 submissions, 10 winners among all the international submissions, following the criteria of quality of the works. The contest had ten main categories: painting, sculpture and installation, photography, video art, computer graphics, architecture, performing art, product design, fashion design and illustration. The second edition of ITSLIQUID International Contest received more than 500 submissions, 10 winners (one for each category) selected by the Jury following the criteria of quality of the work, originality and uniqueness, and 1 winner selected by public vote. 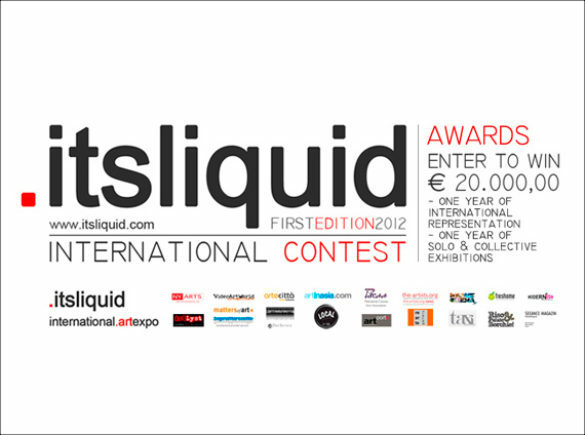 ITSLIQUID GROUP, in collaboration with International ArtExpo, is proud to present "ITSLIQUID International Contest – First Edition 2012". The contest had five main categories: painting and drawing, sculpture and installation, photography, videoart, product design. The Jury was formed by prestigious personalities of the contemporary art, architecture, design scene. The first edition of ITSLIQUID International Contest 2012 received more than 300 submissions, 5 winners (one for each category) and 15 honourable mentions (3 for each category).